I have realized that this hobbie is the best if you overdo everything. At least for me it's the joy of looking at a mini that is done and you know how many hard working hours it took to make it this good. Many times it has crossed my mind that I would speed paint an quite easypainted army. But I see one problem with this action. When me and my friends play battles we normally play with just painted minis ( with some few exception). If there's a mini on the field that is just ok and not excellent we get released when it dies. With this attitude it's not easy to win battles. This is why every mini has to be perfect! One thing to remember, perfect does not necessarily mean just perfect. Yea I know this sounds corny! Let explain. My latest project is Elysian and do them so good as I can. 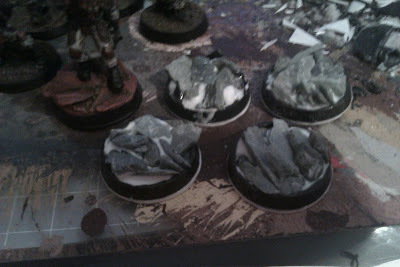 But now I'm at the basing stage and I had a couple of options. Just gravel witch is nice, no more no less. 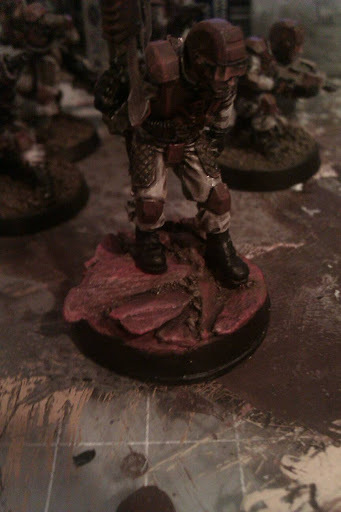 I could have bought resin bases with would look stunning. But I decided to build all bases my self. Just for the love of the mini and the knowledge that I did every thing possible for every single trooper. So I wanted a rocky-mars-looking-dessert-look. 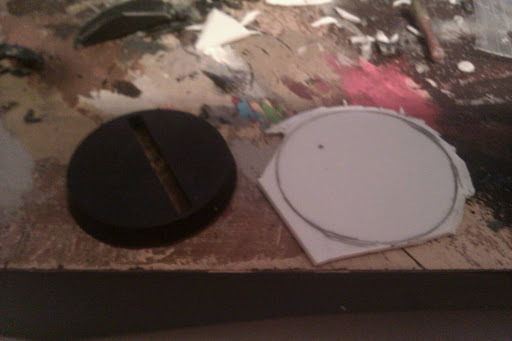 First I cut of the top of a base, then I cut out a bottom in plastic card. Glued them together and filled it with rocks. On top of the of the big rocks I glued gravel that I painted in a complete different colour to make it more alive. Resin bases would probably look even greater but this, this is love. 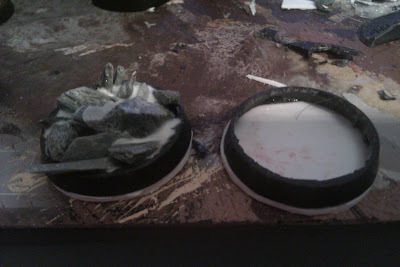 Btw screw resin bases! This is unique and looks way better. Like your hawk eyes Aksel. Didn't see the edges until you told me. I'm right on it. To night I will be living on the edge.